It's time again for #CudaTour, the annual bus tour for employees, partners, customers, and friends, all across North America. The bus already has a couple of stops behind it. We kicked off the tour at Superbowl XLIX in Glendale AZ, spent some time travelling to see partners and customers, and just recently wrapped up a nice week at Indian Wells. Soon we'll head to Miami for our annual Barracuda Sales Kickoff, then San Francisco for RSA. For our full schedule, take a look at the program page here. The tour is a way for us to bring some fun to our customers and partners, but it's also a time for us to share information about our latest technology and research. It gives us a chance to talk about what we've done in the past year and where we're going, and it gives customers and partners a chance to ask questions, one-on-one. Let us know if you've spotted the bus. Tweet us a photo of yourself and the bus, with a mention for @barracuda and the tag #cudatour. We'll retweet it, drop it into our Elevation gallery, and send you a limited edition Elevation Tour t-shirt. 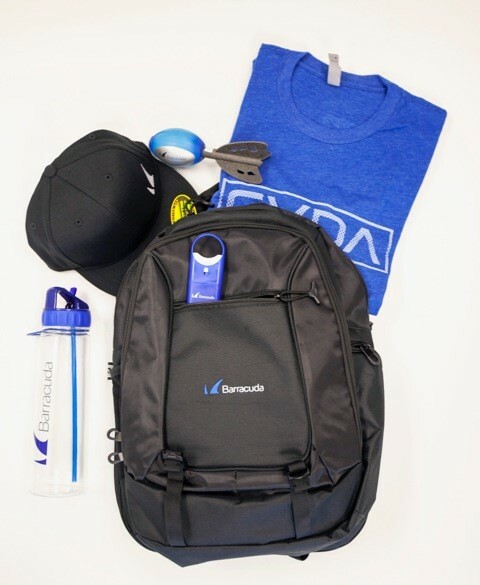 We will also enter you into a drawing for one of two Barracuda sports packs, shown below. If you would like to learn more about the Elevation Tour, visit the program page here. To keep up with the latest on the tour, follow @barracuda and #cudatour on Twitter.